OverviewThis collection includes 28 Sega Genesis / Mega Drive games on one budget-priced disc. The Sega Mega Drive Collection (known in the USA as Sega Genesis Collection) is a video game compilation for the PlayStation 2 and PSP, compiled and emulated by Digital Eclipse and released in the U.S. in 2006 and Europe and Australia in 2007. 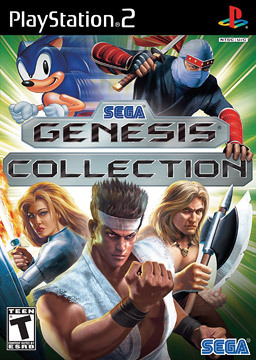 The collection includes twenty-eight (twenty-seven in the PAL versions) Sega Mega Drive/Genesis games from a variety of genres, as well as unlockable classic Sega arcade games, with different sets of arcade games for the PlayStation 2 and PSP versions. Now you can add videos, screenshots, or other images (cover scans, disc scans, etc.) for Sega Genesis Collection (USA) to Emuparadise. Do it now!